Located in north China, a mere 1.5 hours drive from Beijing, Tianjin is a good pick for a travel destination. Built in 1404, the city has long been a major seaport and gateway to the nation's capital and now makes for an important industrial and financial hub in the country. Tianjin enjoys a reputation for being a cradle of folk arts such as Yangliuqing Spring Festival paintings and crosstalk performances; yet what really make the city a place worth visiting is its profound history as portrayed through the numerous landmark buildings scattered across its former concession areas. China.org.cn here presents you with the top 10 Tianjin attractions. Located in a small harbor in Binhai New District, the Tianjin Binhai Aircraft Carrier Theme Park is a large military theme park constructed around the Kiev Aircraft Carrier, covering an area of 5.57 square kilometers. It provides an opportunity for visitors to gain military knowledge and learn some fun facts while playing games and having fun. 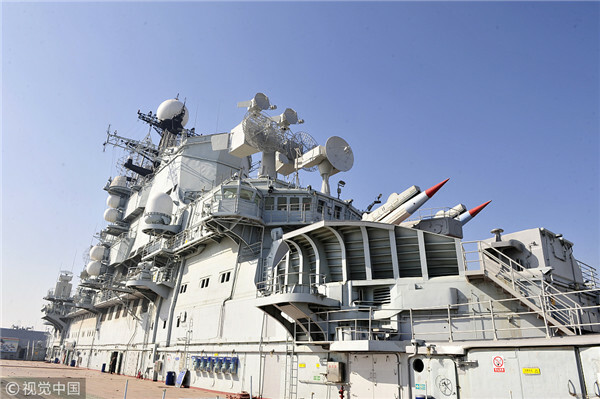 The visitors may have a close look at the command center, intelligence room and the science and technology museum, and enjoy the 4D movies in the aircraft carrier's theater. The only western restaurant on an aircraft carrier in the world is also located here. In addition, if you didn't have the chance to visit the Tianjin Pavilion at the Shanghai Expo, you may want to do it here. It was rebuilt in the park in 2011 to show visitors the history, features and development of the city. Tianjin is a good example of a combination of traditional Chinese and Western features, featuring historic European-style architecture, ancient Chinese cultural streets and beautiful coastline.